I consider myself a part of a wonderful legacy at the school. Washington has been here for my family, for me, and now for my daughter. My mother and aunts attended the then-called Washington Street Elementary in 1947, 1955, and 1956. Now I teach at the school and my daughter, Jordyn, is a kindergarten student. I am heartened to see that our school has been around as long as it has and that I get to be a part of its story. Jordyn enjoys attending Washington Montessori and says everyday that she loves her school. When asked why, she said, "Because its fun and [her teacher] Mrs. Harris is the best teacher in the world who cares about me! she is nice and I learn something new every day!" Like any parent, I was nervous when my daughter began attending school, but knew that she would receive the love, attention, and education she deserves at Washington. At first she was a very shy little girl that would be very nervous in showing everything that she had learned—her grandmother is a retired school teacher and her mother teaches at her school! Now every morning she comes in with confidence and is ready to start the day. I love her being here and I am looking forward to the day that my younger daughter can start her journey at Washington. 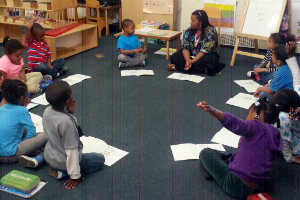 I started my career as a traditional preK teacher and now I am a true Montessori-certified educator. The Montessori philosophy gives children ownership and responsibility for their learning, supports the different ways they learn, challenges them to conquer those areas they struggle with, and teaches them to enjoy learning and discovery. Each day I strive to engage my students and their parents in their learning. As Maria Montessori said, "Free the child's potential, and you will transform him into the world." At Washington Montessori, what works for our children is understanding, dedication, consistency, and caring. We let our students know that, as educators we are here to teach them and help them to learn, but we also are here to listen and understand where they are coming from. As our school approaches its centenary in 2015, I am proud that, even though we've gone through changes and challenges, look at us now! We're still standing with the help of teachers, parents, community leaders, a dedicated staff, and—last, but not least—excited and ready-to-learn students. I love my school and would not want to go anywhere else. Washington Montessori rocks and you can only get that Right Here! Torva Felton is an early childhood preK/kindergarten/multi-age teacher at Washington Montessori School, the winner of the 2014 Vision in Action: The ASCD Whole Child Award. She attended North Carolina Agricultural and Technical State University where she received her bachelor's degree and received her Montessori Certification from Montessori Opportunities. A passionate and committed teacher, Felton is also a "generational" educator at the school: her mother is a former teacher and her daughter is a current student. Check out a paper by Dr. Carol Dweck that is on line. It is about the difference between praise for ability and praise for effort. I think that it will answer a lot of questions about motivation.